The total solar eclipse set to take place this Monday, August 21, is a rare, almost magical treat for anyone interested by what's up there in the sky and how it works. NASA has been preparing for the celestial event, and we wanted to share a few key pieces to help you better enjoy and understand what's about to happen. 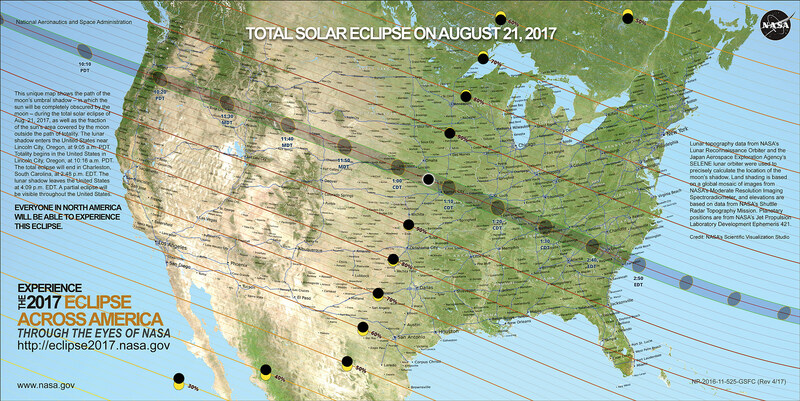 The eclipse will move along a path (see below) of "full totality" -- meaning those people living along that path will see the moon completely block out the sun -- across 14 states, from Salem, Oregon to Charleston, South Carolina. The states are: Oregon, Idaho, Montana, Wyoming, Nebraska, Kansas, Iowa, Missouri, Illinois, Kentucky, Tennessee, North Carolina, South Carolina and Georgia. But even if you don't live directly along that path (and that's most of us), you'll still be able to experience the eclipse, just not at full totality. The farther away from the path you are, the less the moon will cover the sun. Even people in northern Maine or southern Texas will see at least a 50 percent coverage. A partial eclipse is still pretty impressive, though, don't worry. We know your mother probably told you that when you were a kid, and it's at times like these when that is most important. Obviously you're going to want to look at the sun right? After all, that's where the eclipse is. When watching a partial eclipse you must wear eclipse glasses at all times if you want to face the sun, or use an alternate indirect method. This also applies during a total eclipse up until the time when the sun is completely and totally blocked. During the short time when the moon completely obscures the sun — known as the period of totality — it is safe to look directly at the star, but it's crucial that you know when to take off and put back on your glasses. How Rare Is a Solar Eclipse? So if you miss this one, you'll have to wait six years for the next one. Romanieo Golphin, Jr. from Silver Springs, Maryland, appeared on Jimmy Kimmel Live to help everyone understand what's about to occur. We know you just got through reading all that stuff above, but you probably could have just watched this instead. Sorry.